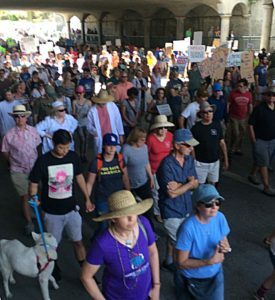 On Earth Day April 22, 2017, over one million people around the world – concerned about recent efforts to discredit science – took to the streets for the “March for Science.” Thousands marched here in Santa Barbara (see image of partial crowd). This support for science is heartening. The efforts to discredit science and scientists are not recent. Science education researchers have been concerned about growing “science denial” for many years now. Science denial is not just refusing to believe “science.” It includes a lack of trust in the process, itself. 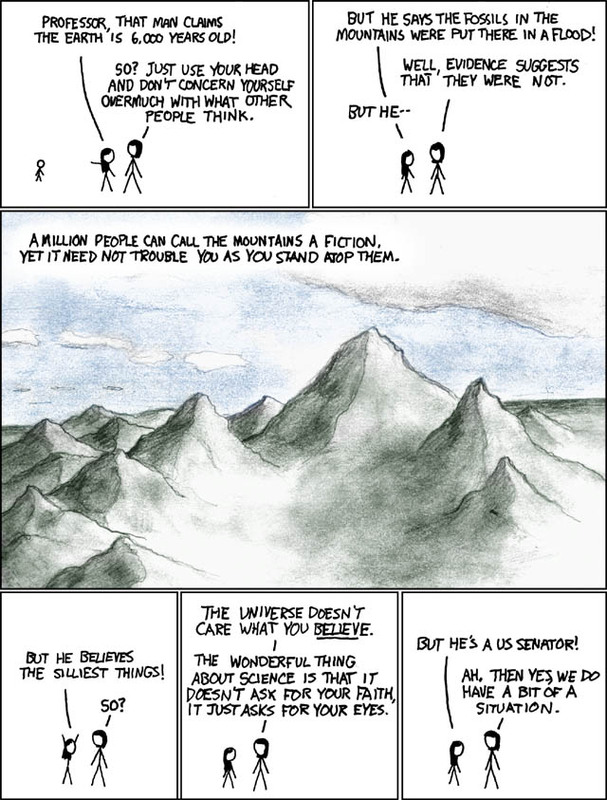 What is science denial? Science denial suggests the scientific process is broken or invalid. Denial of the vaccine safety and efficacy. Denial of global warming and climate change. There is scientific consensus on all of these issues. A belief that these findings are false or the result of some massive conspiracy suggests a belief that the scientific process is broken or not valid in the first place. What is scientific consensus and why should I believe it? Scientific consensus is overwhelming agreement among experts doing research in a field. Like the word “theory” consensus has a specific meaning in science. A published article is not a conclusion. Additionally, scientific studies can have false conclusions, despite the best efforts of the researchers involved. So how can we be so sure of some scientific findings? There are several ways to measure scientific consensus. Within a field, researchers might look for a meta-analysis, which examines how much a particular claim explains what we see in the data of many different studies. One can read review articles from highly respected journals, like Science, Nature, or Plos One. Review articles summarize significant research on a topic and suggest appropriate conclusions. They normally appear if you search for the topic of interest and the word “review” on the journal site. However, these articles can be difficult for people with a more limited science background. Journalists sometimes measure scientific consensus by surveying experts. For more accessible information about politically controversial issues, check out this recent Pew Institute survey of members of the Association for the Advancement of Science. Why is accepting the scientific process important for political activism? Science is the basis for a common objective understanding of the world and is the best tool we have for developing common ground with people who do not share our beliefs. The scientific process is the best system ever designed for rigorous objectivity and our best weapon against “alternative facts.” According to astrophysicist Neil Degrasse Tyson, “If you cherry-pick scientific truths to serve cultural, economic, religious or political objectives, you undermine the foundations of an informed democracy.” If we disagree on the validity of the scientific process, it becomes very difficult to communicate with people who have beliefs that differ from our own. It is not enough to combat science denial with facts that support our point of view. In order to be credible advocates of science, we cannot “cherry-pick” articles and findings we agree with. We need to combat the culture of science denial. The most efficient way is to start by examining and addressing our own earnest science denial. Each of us can reduce science denial by questioning our own assumptions and looking for evidence of scientific consensus. In addition to University and Government websites, the publications Scientific American and National Geographic are excellent resources. Locally, the University of California Santa Barbara (UCSB) offers a number of educational resources for the public. One can find a listing of physics lectures for the public here. For teachers and public school students there is also UCSB’s “Science Line,” where students can send their science questions to UCSB scientists. Supporters of science should also consider donating to organizations that combat science denial and support science education like the American Association for the Advancement of Science or the Union of Concerned Scientists. Science research publication and communication have many problems, but over the course of time, science works, and it improves our understanding of the world. We deny scientific consensus because it conflicts with our existing beliefs or it suggests policy that is inconvenient and seems risky, based on the information we have from our personal experience. This undermines our ability to share an objective reality and communicate effectively with people whose experiences and beliefs differ from our own.